Effective as of March 14, 2017, the NYSTCE ALST (202) is no longer a requirement for certification and the test will be discontinued. 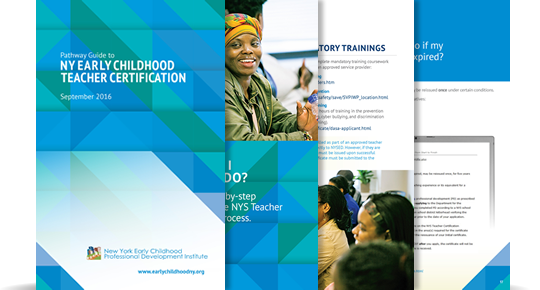 The Guide contains step-by-step instructions to fulfilling the requirements set forth by the State of New York to become certified in Early Childhood Education (Birth — Grade 2). Use this information as a starting point for charting your course to becoming an early childhood classroom teacher. If you have any questions on certification topics not covered in this booklet, please reach out to our Career Development Center. One of our Career Advisors will be happy to provide guidance specific to your needs. All of the information detailed is made available through the New York State Education Department and the New York State Teacher Certification Exam organization and is valid as of July 1, 2016.